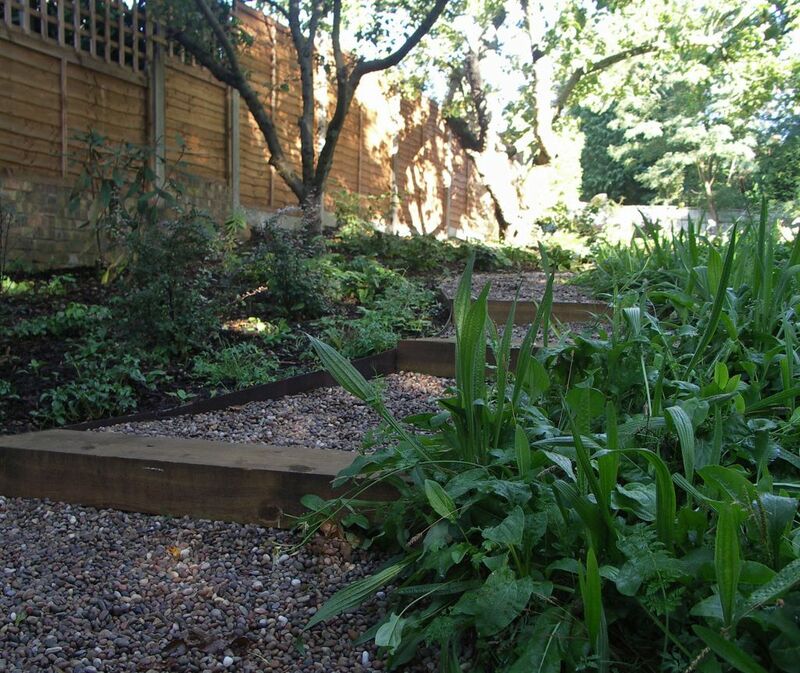 This restful wildlife water garden in Finchley has four watery elements. The square upper pool discharges over a stainless-steel chute and the cascade falls gently into the rill. This flows to a shallow diamond-shaped pool. In the corner of the garden is a pond set in an area dedicated to wildlife. 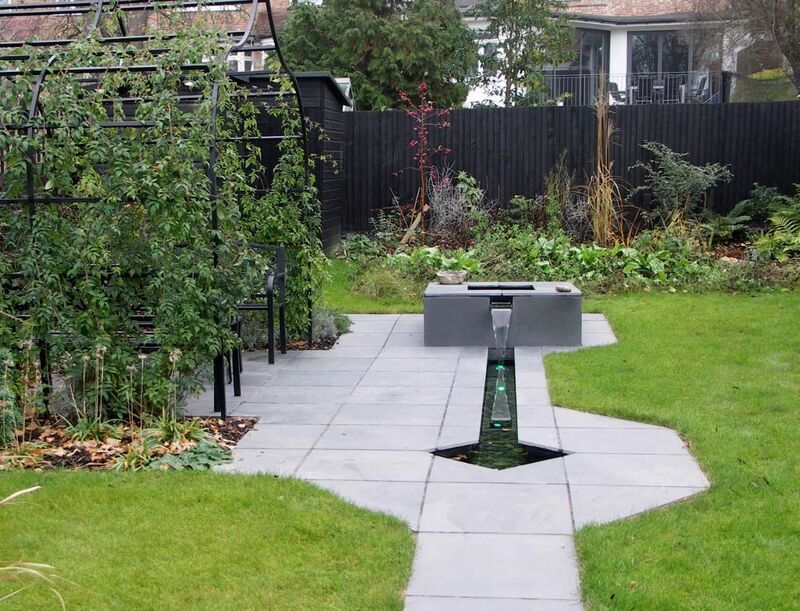 Water circulates through the shallow rill and lower pool. 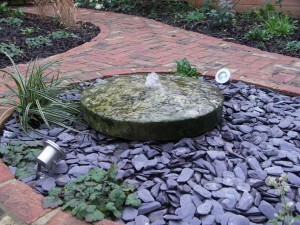 The base of the rill and lower pool is covered with flat green pebbles. Frogs enjoy paddling and basking in the lower pool and birds can wash and take a drink. At night, soft green lights provide subtle illumination. The water is filtered and pumped up to the upper pool. 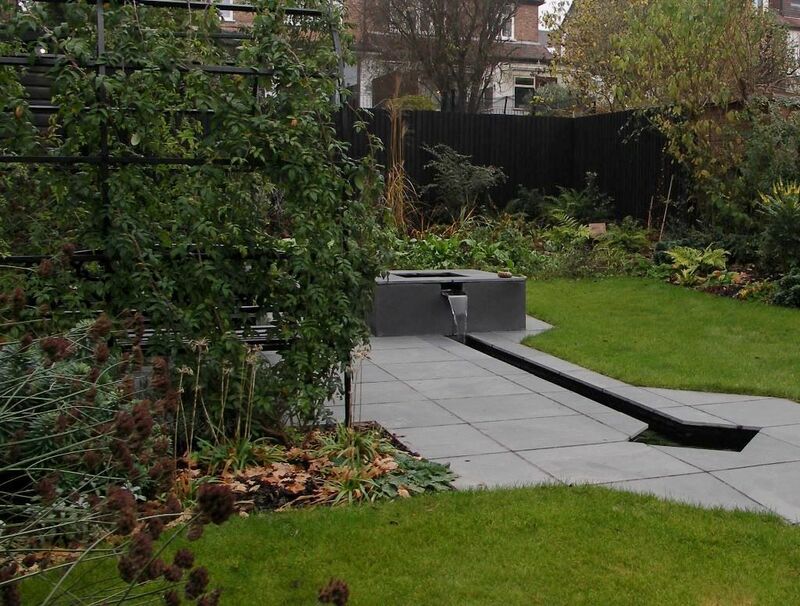 The sides and top of the upper pool are clad with black slate and the edges form an informal bench. Black slate paving looks black when wet and mid grey when dry. It contributes to the restful feeling of the garden. 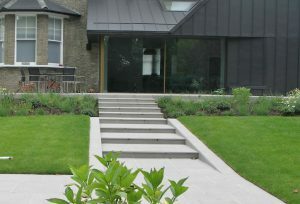 The green lawn and green planting contrast well with the dark paving. The hexagonal shapes set off the geometric elements of the water garden. The ‘S’ shaped arch goes to a point (the shape is ‘Ogee’) and gives a tall interesting structure for climbing plants. The arbour encloses bench seating and a table. Rosa ‘Rambling Rector’ will cover it with creamy-white scented flowers in summer. Red rose hips provide food for birds. All the elements are black powder-coated metal and match the black fencing and sheds. Small mammals and birds visit the wildlife water garden. They enjoy the cover of the small meadow and the seed heads for winter food. Insects, including rare stag beetles, make the most of hiding places in the fernery among wooden logs and tree stumps. 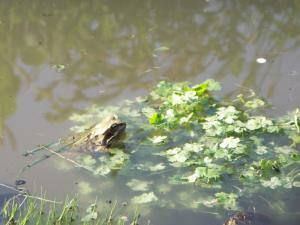 Frogs and insects love the wildlife pond too. The pond plants include lemon water lilies, white Lizards Tails and blue iris. Frog enjoys the wildlife pond! Mixed hedging with flowers and berries includes hawthorn, pyracantha, Darwin’s barberry, spindle and Portugal laurel. A rowan, red crab apple and cotoneasters provide winter berries for birds. Bees love the meadow flowers, abelias, thyme, lavender and foxgloves and there is plenty for butterflies too! This entry was posted in Wildlife Water Garden and tagged arbour, Garden Design, Leaf & Acre, North London, Planting Design, pools, rill, water garden, wildlife on November 22, 2018 by admin. 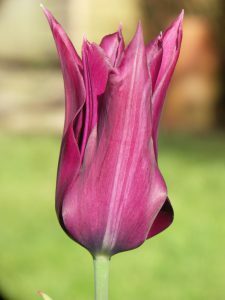 My favourite elegant tulips have stunning petals in unusual colours. They are the stars of the garden in mid to late spring. Depending on the weather, they last only a few weeks but are well worth it. Keep them watered to get the best from them. 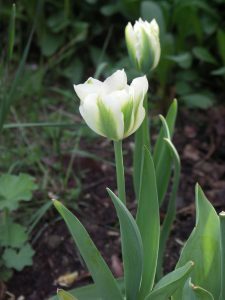 Most tulips like a lot of sun. When the petals finally droop, cut the seed pod off and let all the rest of the foliage go yellow. This regenerates the bulb for a strong flower next year. These are some of my favourites. Under a cloudy sky these are almost black. In sun, they have a deep claret tint. The petals are exquisitely shaped with a smooth rounded edge. They grow to about 60 cm tall, with a single flower on tall stems. Surely one of the most elegant tulips. They look beautiful against new bright green foliage. Use the dark colour to contrast with soft yellows of late narcissus or the bright orange of lily flowered Tulipa ‘Ballerina’. With a streak of green through apple-white petals, these are unusual and elegant tulips. They grow to about 45 cm tall. 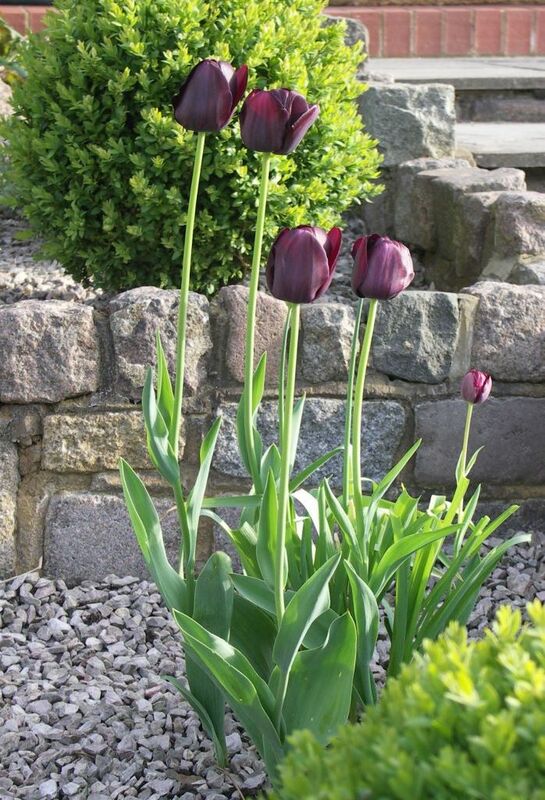 Group these to contrast with red tulips to provide a stunning display. 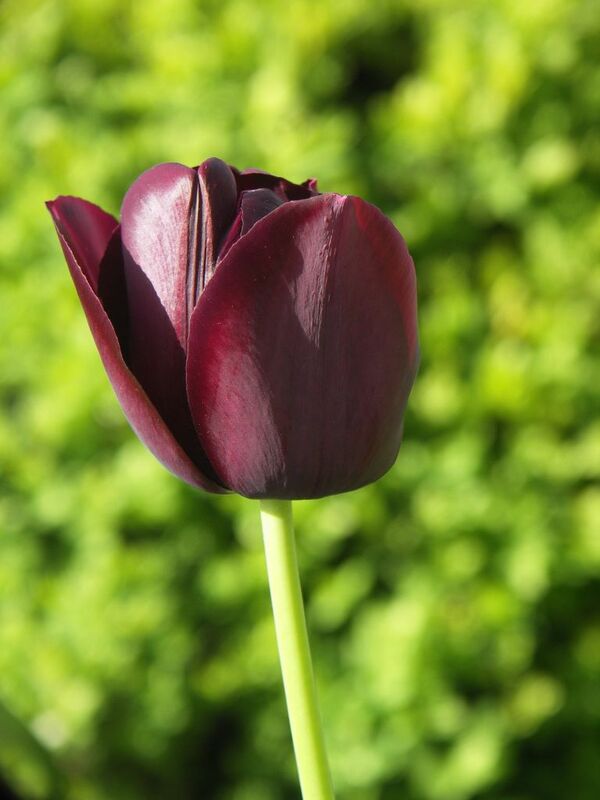 The bright scarlet Tulip ‘Apeldoorn’ would be a beautiful choice. With carmine-rose petals, they have pale yellow margins and are limey-yellow inside. They are slim and about 25 cm tall, lovely in pots or in front of a sunny bank. 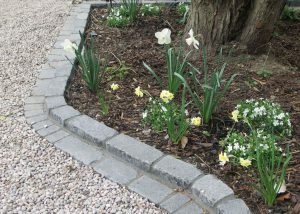 They would also work well in a rock or gravel garden. A lily-flowered variety, these are most elegant tulips, shaped like a fluted vase. The sun shines through the petals to reveal slight linear markings. They look dark before the sun illuminates them. In the sun, they open right up to show their markings. They grow to about 50cm. 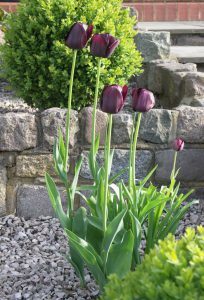 This entry was posted in Elegant Tulips and tagged Elegant Tulips, Garden Design, Leaf & Acre, North London, Planting Design, Tulipa 'Spring Green', Tulipa clusiana 'Cynthia', Tulipa' Burgundy', Tulipa' Queen of the Night' on April 25, 2018 by admin. 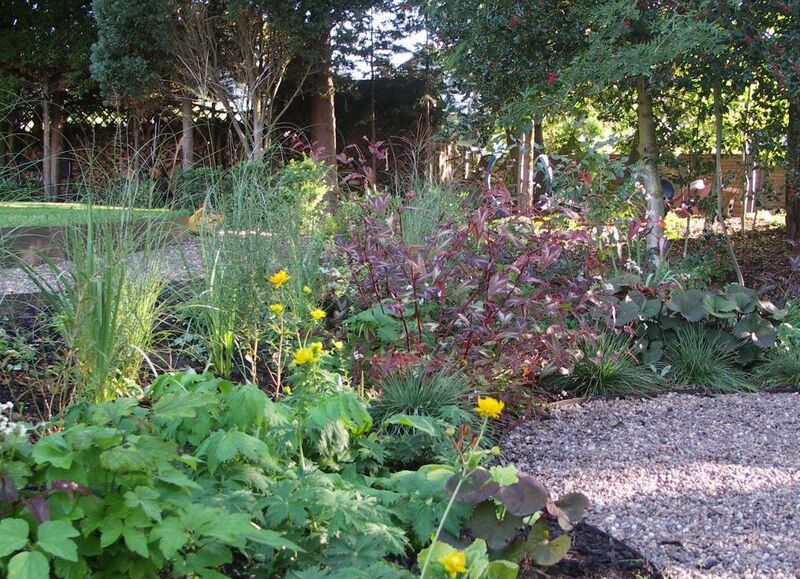 Mature ash, sycamore, oak and holly make a natural setting for this woodland garden. The dappled shade suits many shrubs, bulbs and herbaceous plants. 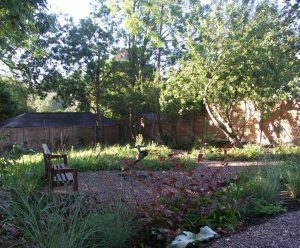 Whether in the heat of summer or darkest winter, the woodland garden provides a lovely family retreat in Whetstone, North London. The woodland garden is on a fairly steep slope with a bank to one side. 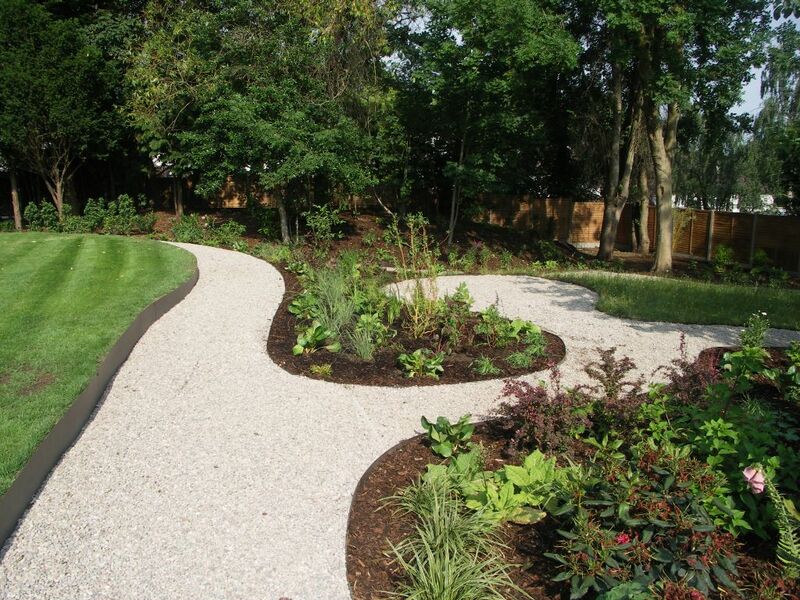 An informal curved path meanders around the garden. The path broadens to include areas to sit. We used small Atlantic pebbles for the path surface. The curved shape is retained with powder coated metal edging. We used wildflower meadow turf to make the woodland glade. The selection of meadow plants suits dappled shade and includes Meadow Cranesbill, Ragged Robin, Primrose and Ox-eye daisy. Flower interest over a long period includes early violets, the soft yellow of Lady’s Bedstraw and and the vibrant pink of red campion. It is very easy to maintain with a mow once or twice per year. 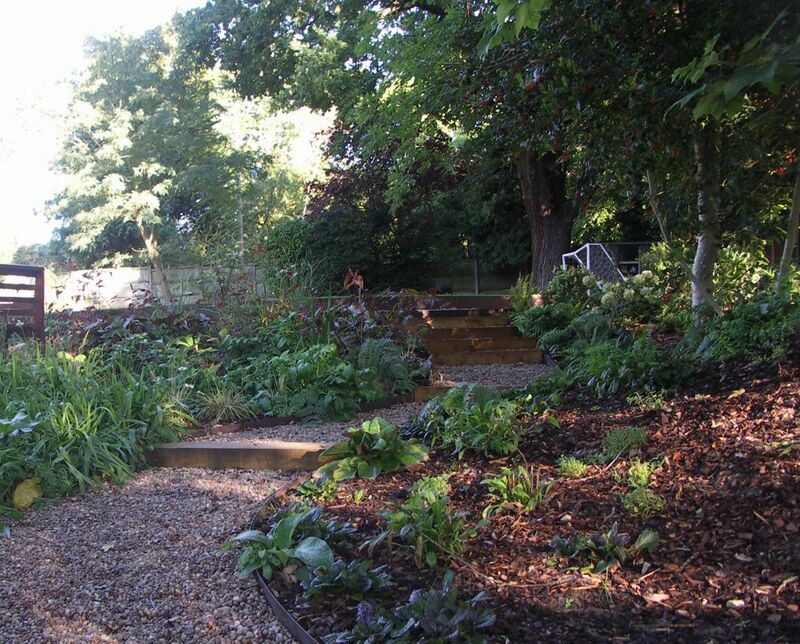 Magnificent oak, ash and sycamore provide the framework for this woodland garden. We added brightly coloured willows in the wetter and sunnier areas. 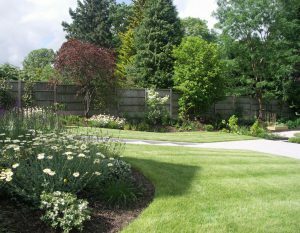 Silver birches are included in the dry sunny areas and specimen Magnolia and Amelanchier trees add flower interest. The areas in deepest shade have ferns: Dryopteris affinis, Blechnum spicant and Polystichum polyblepharum. In between are pink foxgloves and purple Mourning Widow. Pink Snowberry and evergreen viburnums give shrubby structure. The dry bank is planted with violets, Sweet Woodruff, Epimedium and Pachysandra. Other carpeting shrubs weave between tree roots. This damp bank is the sunniest part of the garden. Bog plants with bright flowers thrive here. These include Ligularia dentata ‘Desdemona’ which has fabulous heart shaped leaves. Yellow globe flowers, white valerian and rose-coloured iris appear in summer. Different grasses provide structure . Late flowering anemones, Purple Loosestrife and Persicaria ‘Red Dragon’ continue a long season of interest. 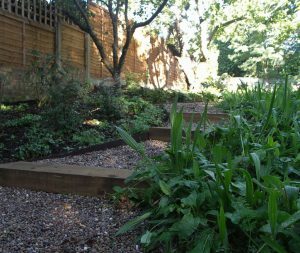 This entry was posted in Woodland Garden and tagged curved gravel path, ferns, Garden Design, Leaf & Acre, North London, Persicaria 'Red Dragon', Planting Design, sleeper steps, Whetstone, woodland garden, woodland walk on January 31, 2018 by admin. 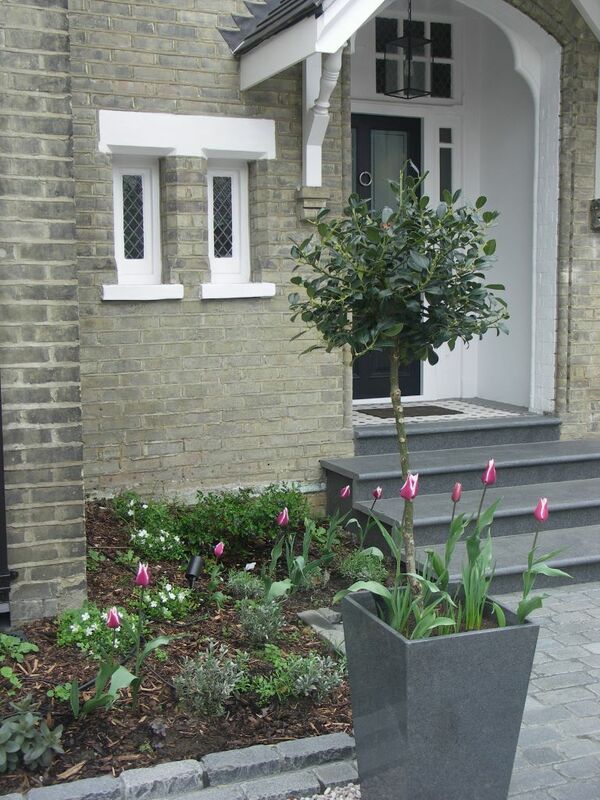 Understated elegance typifies the best Victorian front gardens whether large or small. Mosaic tiles on a path or porch can be given a contemporary look using greys and blues. Rope edging or traditional setts along paths and borders are sympathetic to the period and new railings in Victorian style echo days gone by. Here the mellow yellow bricks of the large Victorian house are contrasted with greys. The geometry of the bay window is echoed in the border shapes which are edged in basalt setts. Smart new basalt steps lead to the Victorian tiled porch. The tile pattern is a twist on a traditional style using shades of grey, black and white. 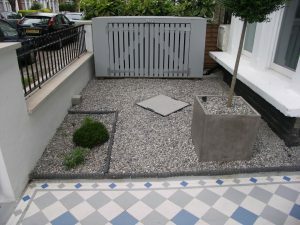 In this tiny garden, a lovely blue and grey tiled path leads to the front door. I designed a neat bin store to fit the space. It blends in perfectly with its grey painted finish. The new Victorian- style railings have contemporary ball finials to add a touch of fun. The old wall was re-shaped, rendered and painted and finished with stone copings. All Victorian Front Gardens should have interesting plants as the Victorians were avid plant collectors. A lollipop stem of flowering privet in a large planter with a small rope-edged border including penstemon and hebe gives evergreen interest in the small garden. In the larger garden, grander borders include the architectural Aralia elata, winter flowering viburnums, holly and creamy roses. Holly balls on stems in granite planters frame the entrance. 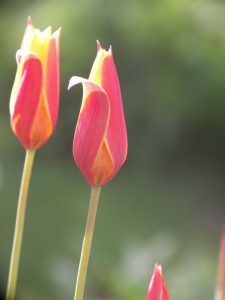 Tulipa ‘Claudia’ is a colourful addition in spring with narcissi. 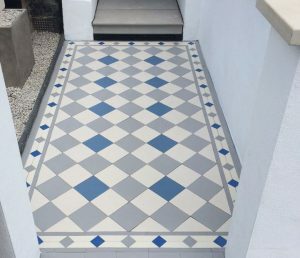 Reproduction Victorian tiles in a variety of geometric shapes are available from specialist suppliers in a range of colours. I designed the patterns for expert tilers to lay on prepared bases. The basalt setts were laid and cut beautifully to curved shapes by experienced landscapers. 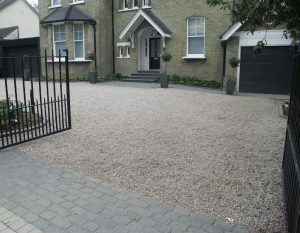 The gravel driveway has Scottish Atlantic pebbles over a honeycomb grid for strength. 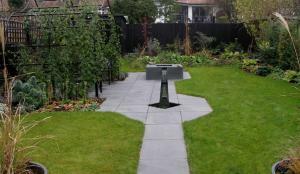 The dove grey pebbles in the small garden tone with the other greys in the garden. This entry was posted in Victorian Front Gardens and tagged basalt setts, basalt steps, bespoke bin store, dove grey pebbles, Garden Design, granite planters, Leaf & Acre, North London, Planting Design, rope edging, Scottish Atlantic pebbles, stroud green, Victorian Front Gardens, Victorian tiles, Victorian-style railings, Whetstone on October 9, 2017 by admin. 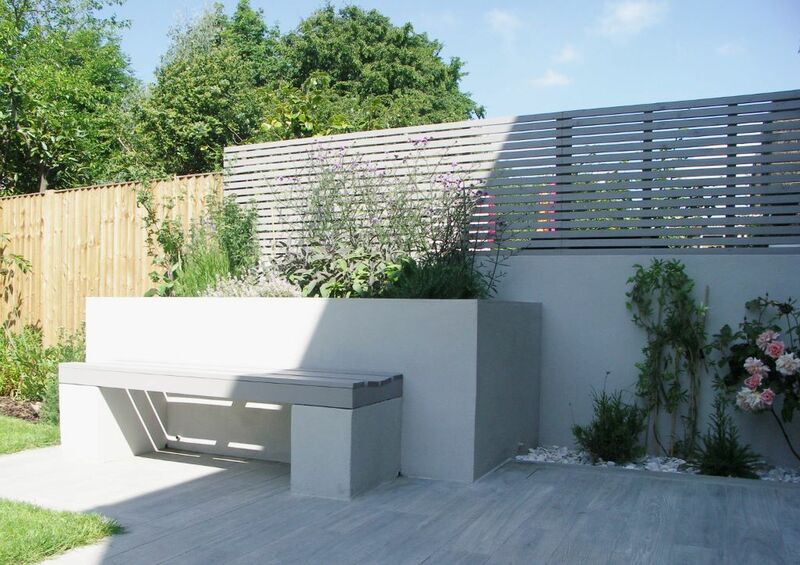 The crisp lines of this contemporary raised planter with built-in bench seat are set-off by the stylish porcelain plank paving. 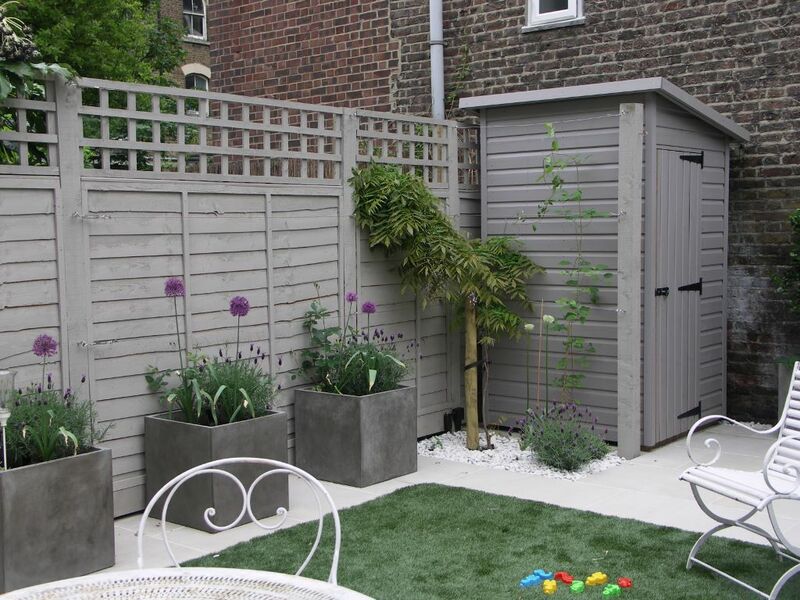 The subtle grey colours of the tiles are echoed in the seat and the privacy screen behind the planter. The planter is constructed from blockwork which is rendered and painted. It has a matching wall section behind it with painted slatted screens above the wall. The top and top inside edges of the planter are finished with porcelain planks to match the paving. These faces are easily cleaned to keep the contemporary raised planter looking good. The bench is constructed the same way as the planter and attached to it. The wooden slats of the seat are gently angled for comfort and painted in the same colour as the screen. 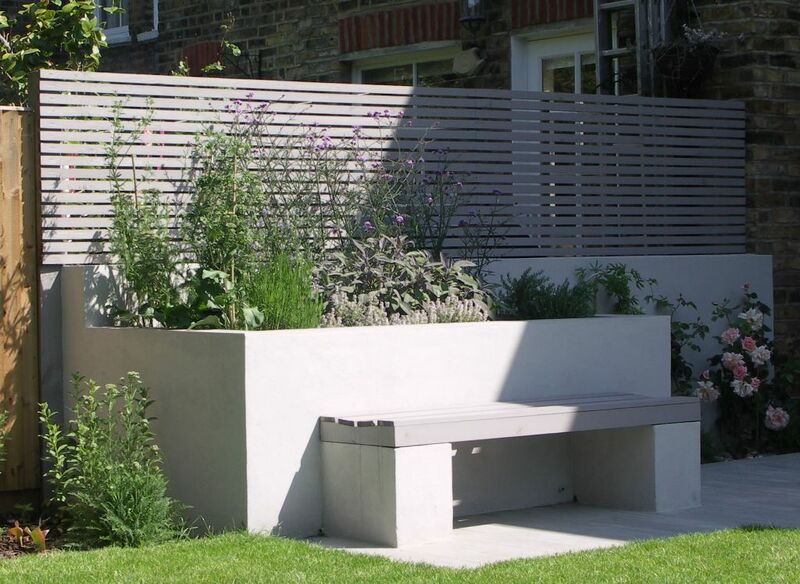 The contemporary raised planter and bench feature adds height and interest to the garden. 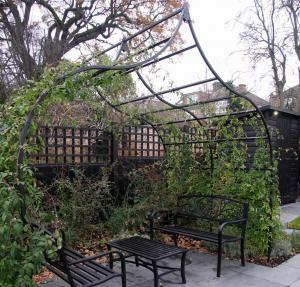 It is used often as a place to sit in the sun in this garden in Muswell Hill. Sun-loving sage, other culinary herbs, lavender, Verbena ‘Lollipop’, and Achillea fill the planter with scent and colour. Rosa ‘Compassion’ and a white passion flower will climb-up the wall and screen. Opposite the planter, is a pebble bed with box balls and pink and violet-flowered penstemons, scabious, salvia, geraniums and gaura. Planks of grey wood-effect exterior porcelain tiles match the interior kitchen tiles. The shadows and light on the tiles give a beautiful effect. 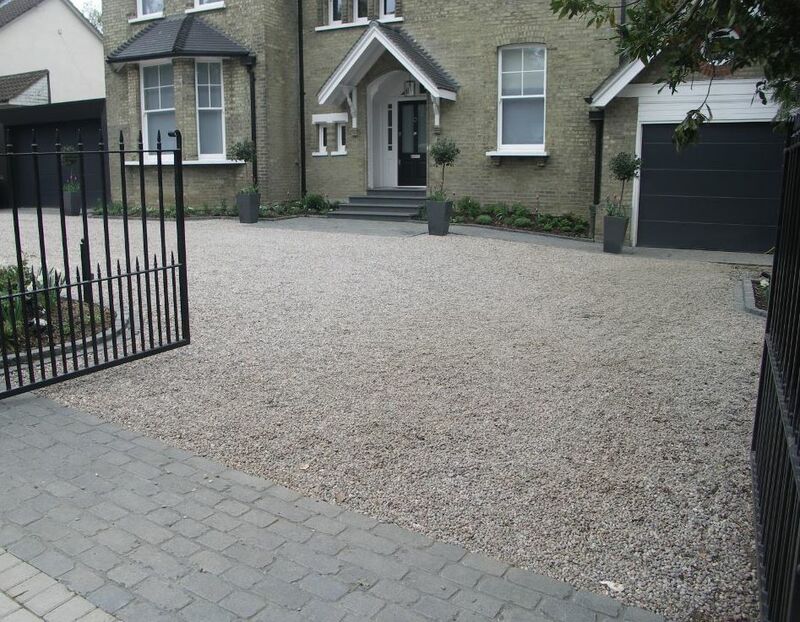 They are easily cleaned and are complemented with pink, grey and white flamingo pebbles around the edges of the paved areas and in the pebble bed. 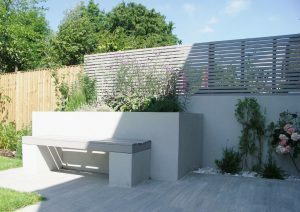 This entry was posted in Contemporary Raised Planter and Bench Seat and tagged Built-in bench seat, Contemporary Raised Planter, flamingo pebbles, Garden Design, Leaf & Acre, Muswell Hill, North London, Planting Design, Porcelain wood-effect plank paving, Rosa 'Compassion', Slatted screen, Verbena 'Lollipop' on June 28, 2017 by admin. Long, smooth curves sweep along the lawn to a curved patio to provide garden interest with the creation of different spaces. 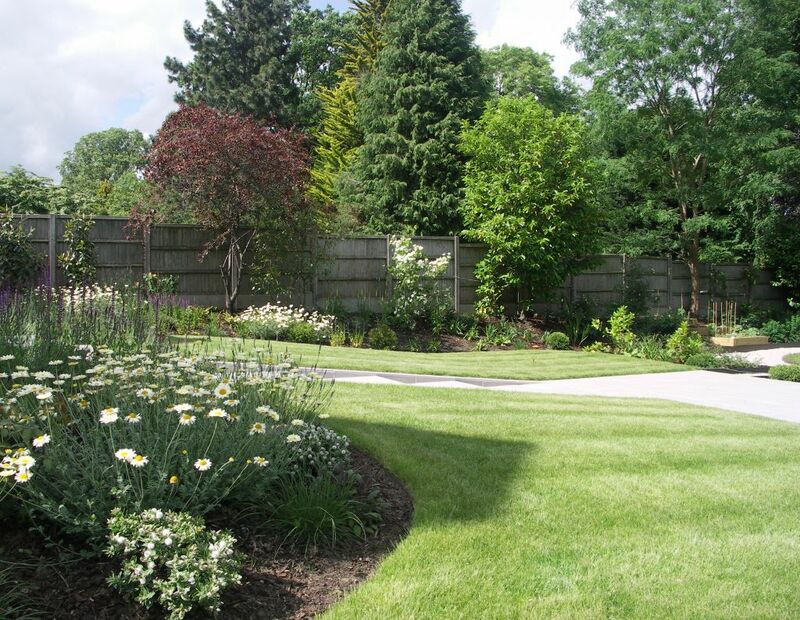 The elegant curves allow some deeper borders in a narrow garden and make it feel wider. The lawn shape is assymetric and striking. It includes a circular area to give a feeling of width. Stepping stones along one side of the lawn emphasise its shape and provide a convenient path to the patio. 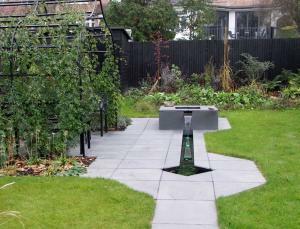 The shape of the curved patio is a compressed version of the lawn shape. Overall, the smooth curves give interest to the fairly narrow, rectangular shape of the garden. Different border shapes have different plants to suit the amount of sunshine in each. The sunniest areas include French lavender, alliums, sea hollies and black lace elder with palest pink flowers . Tall white foxgloves, dark delphiniums and roses flower in early summer. Later, coneflowers, yellow Helianthemum ‘The Bishop’ and purple sedums bring more colour. In a shady area, near the painted shed, a lovely Japanese maple – Acer palmatum ‘Beni-hagoromo ‘ brings garden interest from spring to autumn. Around it hellebores, ferns and a sedge grass give winter interest. 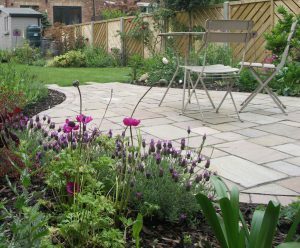 Tumbled sandstone setts with soft grey, pink and green tones bring a relaxed feel to this town garden in Tottenham, North London. The tumbled finish gives a smoother, aged look to the paving. The setts are in mixed sizes and the largest size was used for the stepping stones. 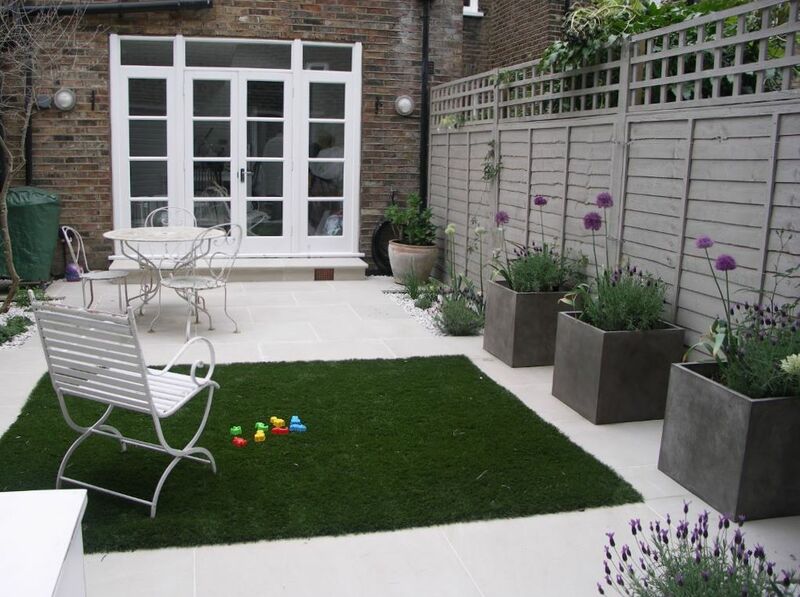 The soft curves of the patio are easily achieved with the mixed sizes and smaller setts frame the shapes. 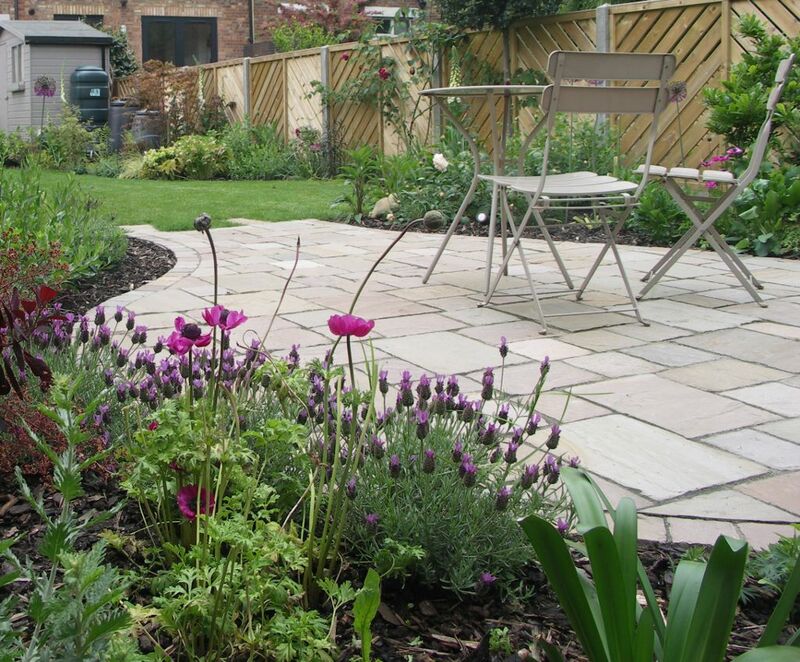 The paving colours work well with the colourful planting. 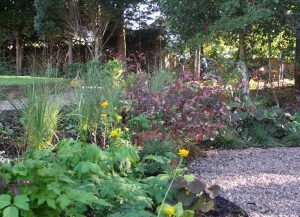 This entry was posted in Smooth Curves for Garden Interest and tagged Acer palmatum 'Beni-hagoromo', black lace elder, French lavender, Garden Design, garden interest, Helianthemum, Leaf & Acre, North London, Planting Design, Smooth curves, Tottenham, Tumbled sandstone setts on June 13, 2017 by admin. 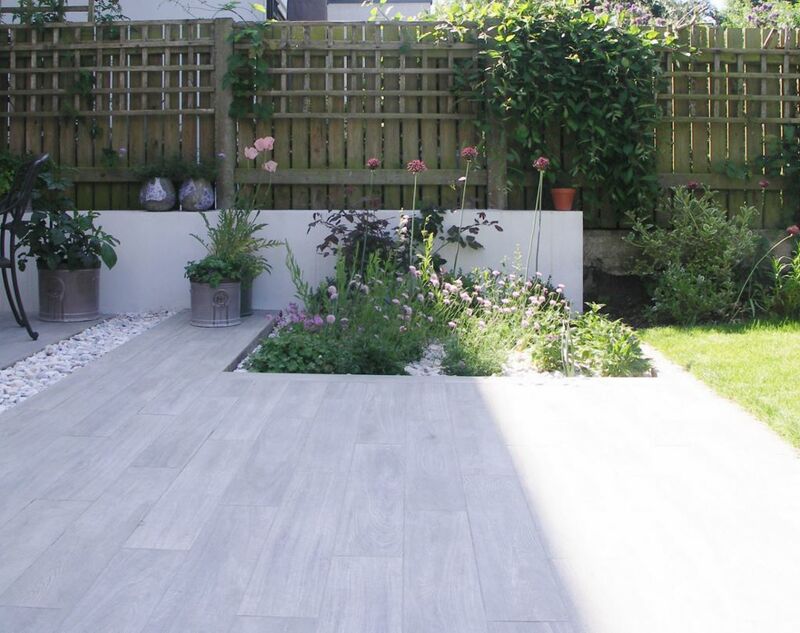 Pale grey exterior tiles make a stunning porcelain terrace and sunken steps. They work beautifully to set –off this lovely Victorian house. The elegant steps lead down to the lower patio which benefits from late afternoon sun. Sunken steps, tiled in pale grey porcelain. 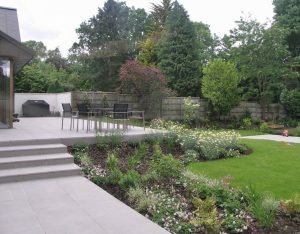 Replacing a sheer rockery edge with steep steps down to a flat terraced area, this design uses gentle slopes and banked borders instead. The new terrace is spacious with a barbecue and dining area. The steps are sunken into the lawn and are almost concealed by it. The low step heights make them an easy path to the lower patio. The rolling lawn also provides a place to play. Sunny free-draining banks are perfect for long stemmed Lavendula x intermedia ‘Grosso’ and purple salvias. In late spring, the star of the show is a pale yellow daisy – Anthemis tinctoria ‘Sauce Hollandaise’. Sun-loving evergreen hebes provide year-round structure. 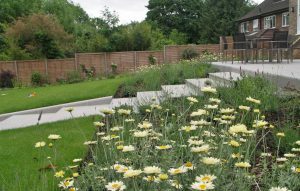 Grasses, herbs and pale yellow roses complement the scheme. Porcelain tiles match those in the kitchen area to give a seamless experience between inside and out. Exterior tiles have an embossed surface to provide a good grip for walking. Careful preparation of the base for the tiles is essential as are the right falls to avoid water collection. Porcelain is impermeable and stainproof. Maintenance is simple, needing only a wash with soapy water or a hose. The sunken steps are paved in the same tiles to complete the elegant design. This entry was posted in Porcelain Terrace and Sunken Steps and tagged Anthemis tinctoria 'Sauce Hollandaise', Garden Design, Lavendula x intermedia 'Grosso', Leaf & Acre, North London, Planting Design, Porcelain tiles, sunken steps, Whetstone on June 11, 2017 by admin. Beautiful light beige sandstone and an area of artificial grass make this low maintenance patio garden feel more spacious. 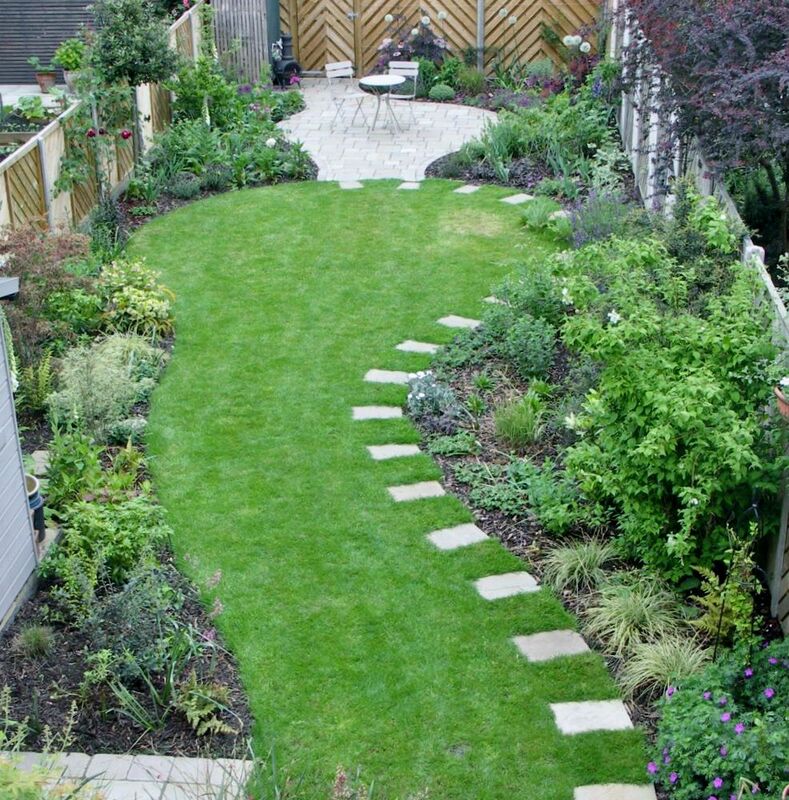 The small borders have plants that will climb up the boundaries to make it feel as green as possible. 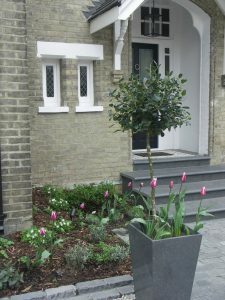 The square grey planters complete the neutral colour scheme. This little family garden in Stroud Green was cluttered and overgrown. The simple new design uses soft grey and light beige as a backdrop to purple and white planting. 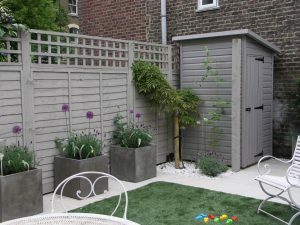 The fences and two little sheds are painted in grey and provide much needed storage. A toy box doubles as a seat in the garden. There is now room in this patio garden for dining and for play. 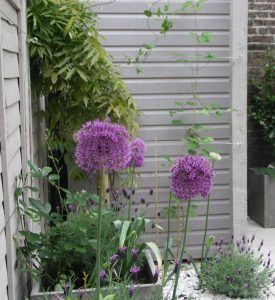 Even though the space is small, the square grey planters are large enough for white climbing roses, lavender and purple alliums. On the shadier side, the planters contain hydrangeas with large white flower balls and purple clematis. A small wisteria, will be trained like a tree to keep it neat. A climbing hydrangea and a white passion flower will also clothe the fences. The beige sandstone for the paving and step is very smooth. It is sealed and laid to a gentle fall to avoid water collecting. 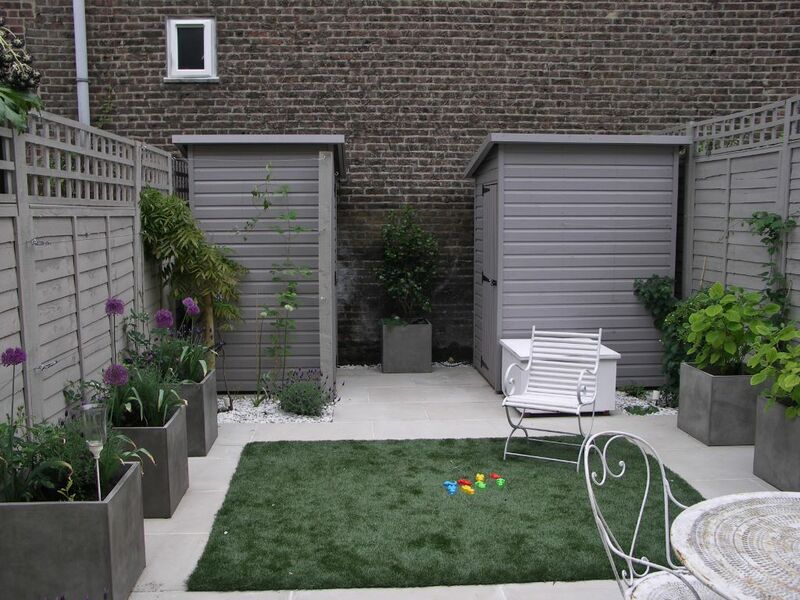 The paving size is large to increase the feeling of space. 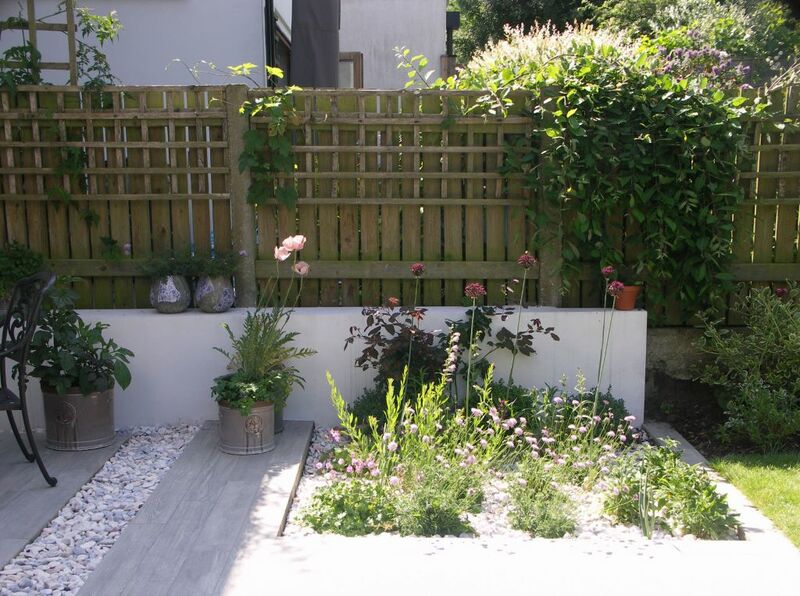 Beige pebbles in the plant borders complete this low maintenance patio garden. This entry was posted in Patio Garden and tagged alliums, artificial grass, beige sandstone, Garden Design, lavender, Leaf & Acre, low maintenance, North London, patio garden, Planting Design, square grey planters, stroud green, wisteria on June 27, 2016 by admin. 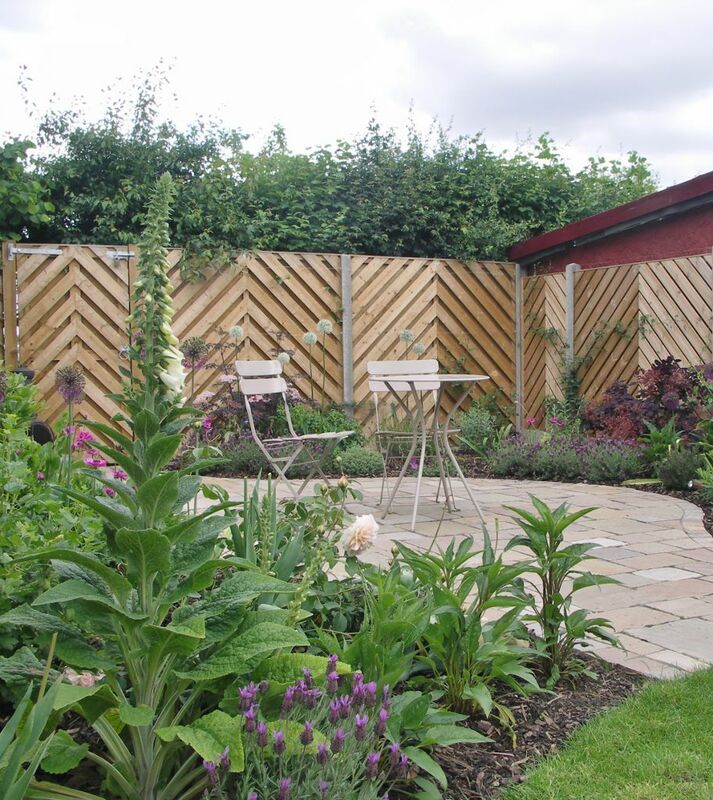 Horizontal smooth cedar boards make a beautiful contemporary fence. 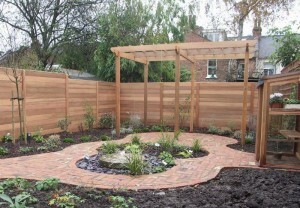 Long lasting, low maintenance and rather beautiful, a cedar fence can be a great solution for an attractive boundary. The material is available in different sizes and finishes. It can be installed using horizontal boards or upright boards to suit the garden style. This cedar fence in East Finchley has horizontal boards of Western Red Cedar ( species: Thuja plicata). 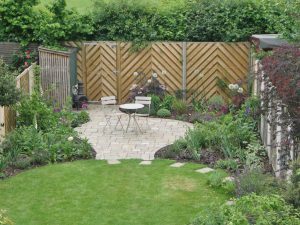 The boards are planed all round so the fence looks smooth and really good on both sides. 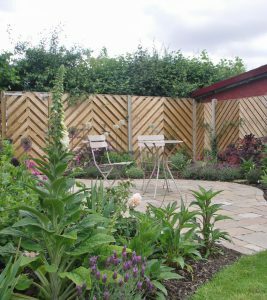 In a small garden the horizontal boards give a feeling of length and width. The posts are all planed for a smooth finish and planed trim boards cover the joints. 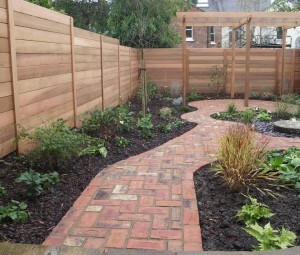 Each of the fence boards has a different character with a unique grain pattern and colour. These ones are clear grade without knots and range in colour from a pale pinkish colour to a richer cedar colour. The wide boards have very small gaps between them for expansion and contraction. The edges are profiled to close the gaps for privacy so it looks pretty much like a solid fence. Very little maintenance is required for Western Red Cedar. It is a softwood native to the Pacific coast of British Columbia and has been used for thousands of years by the First Nations of Western Canada and North West America. 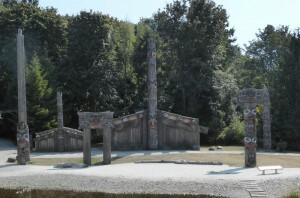 The picture shows a reconstruction of traditional homes at the UBC Museum of Anthropology. The cedar is durable and naturally resistant to decay. It is generally recommended that new wood is protected with a clear breathable sealant. Thereafter, the wood can be allowed to weather slowly to a silvery grey without any further treatment. Alternatively, to preserve the cedar colour, an oil would need to be applied annually. 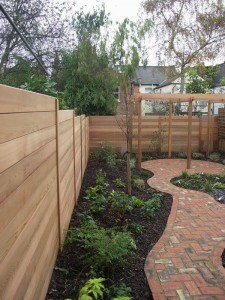 This entry was posted in Cedar Fence with Horizontal Boards and tagged cedar fence, East Finchley, Garden Design, horizontal cedar boards, Leaf & Acre, low maintenance, North London, western red cedar on March 7, 2016 by admin. 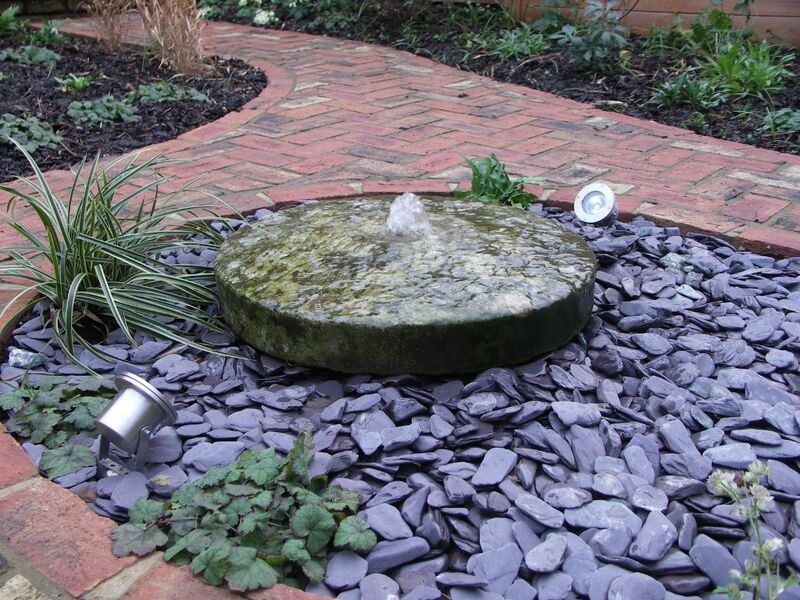 A millstone water feature provides a focal point in a courtyard garden or entrance area. Water flows through the centre and cascades gently bringing a sense of calm. 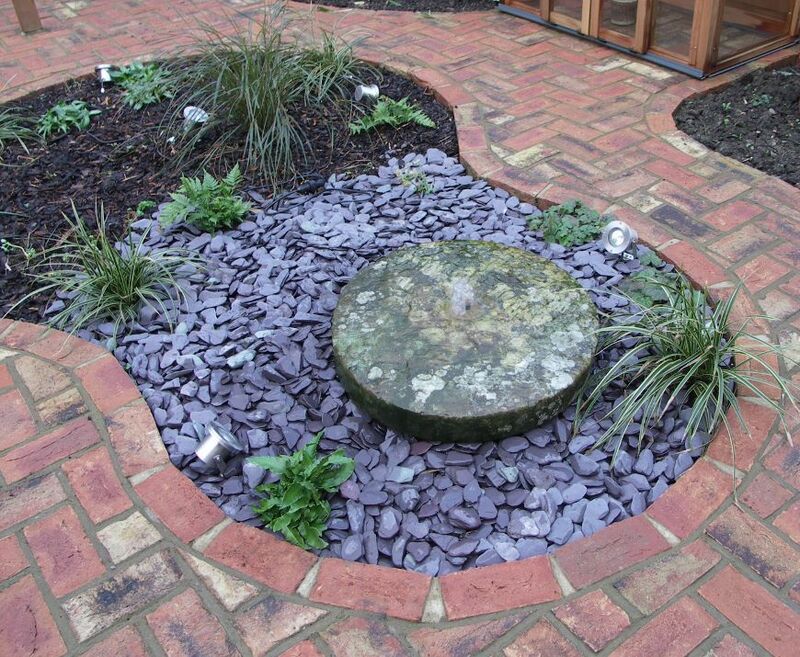 Once used for crushing grain into flour, the antique millstone links history to this garden in East Finchley. 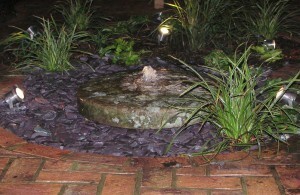 With garden lighting, the water feature looks great at night too. 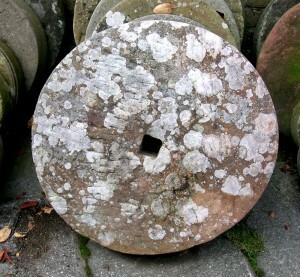 This red sandstone millstone spent its working life in the 19th century in a mill in Cumbria. Since being discarded in the countryside, it became very weathered with lichen. In its new life as a millstone water feature, the lichen pattern will change as the water flow creates a new micro-climate and local ecology. It all adds to the charm and changing interest of the water feature. Water is pumped from a reservoir below the millstone. It flows through the hole in the top and then cascades gently over the sides. Stainless steel uplighters direct their beams on to the water. The small fountain look likes a flame! Grey slate paddlestones cover the waterworks and electric cables. My design makes it easy to remove the pump if needed. My garden design sits the millstone water feature in a larger island bed. 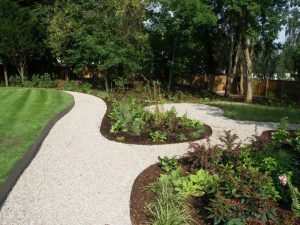 The clay paver path provides a route around the garden. We completed the planting in November and it will fill out in 2016. There is already some winter interest with evergreen tiarella, carex and ferns. The larger pheasants tail grass will give wonderful autumn colour into winter. Spring and summer will bring soft seasonal colour with pink and white columbine, lilac day lilies, palest blue veronica and pink astrantia. 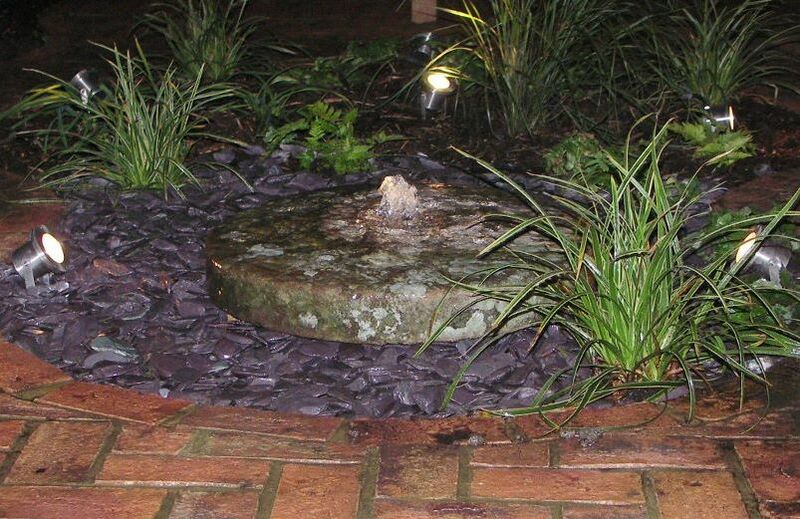 This entry was posted in Millstone Water Feature and tagged Clay Pavers, East Finchley, Garden Design, Garden lighting, Leaf & Acre, Millstone Water Feature, North London, Planting Design, slate paddlestones on January 20, 2016 by admin.